Control Source— The Control Source property specifies the field in the report’s record source that’s used to populate the control. An example is FirstName. A control source can also be a valid expression. Running Sum— The Running Sum property (which is unique to reports) is powerful. You can use it to calculate a record-by-record or group-by-group total. You can set it to No, Over Group, or Over All. When set to No, no running sum is calculated. When it is set to Over Group, the value of the text box accumulates from record to record within the group but is reset each time the group value changes. An example is a report that shows deposit amounts for each state, with a running sum for the amount deposited within the state. Each time the state changes, the amount deposited is set to zero. When this property is set to Over All, the sum continues to accumulate over the entire report. Figure 8. The data properties specify information about the data underlying a report control. A common mistake many Access developers and users make is to give controls names that conflict with Access names. This type of error is difficult to track down. You need to make sure you use distinctive names for both fields and controls. Furthermore, you should not give a control the same name as a field within its expression. For example, the expression =ContactName & ContactTitle shouldn’t have the name ”ContactName”; that would cause an #error# message when you run the report. Finally, you shouldn’t give a control the same name as its control source. Access gives a bound control the same name as its field, and you need to change this name to avoid problems. Following these simple warnings will spare you a lot of grief! Figure 9. The Other properties of a control. 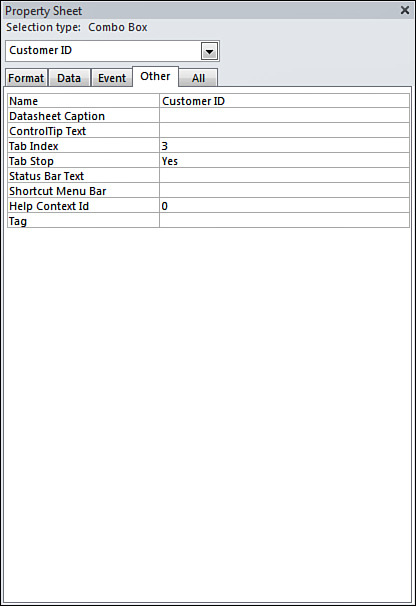 Name— The Name property provides an easy and self-documenting way to refer to a control in Visual Basic for Applications (VBA) code and in many other situations. You should name every control so that you can easily identify them in queries, macros, and so on. Vertical— The Vertical property is used to determine whether the text within a control is displayed vertically. The default value for this property is No. Tag— Like the Tag property of a report, the Tag property of a control provides a user-defined slot for the control. You can place extra information in the Tag property.